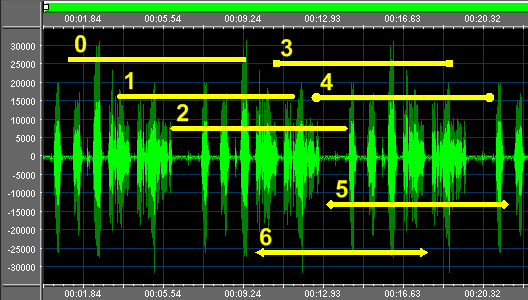 The WANALYZER_HORIZONTAL_LINE structure (defined as WANALYZER_HORIZONTAL_LINE_DLL when used for COM interoperability) describes settings applied to a horizontal line added to the Waveform Analyzer through the WaveformAnalyzer.GraphicItemHorizontalLineAdd. 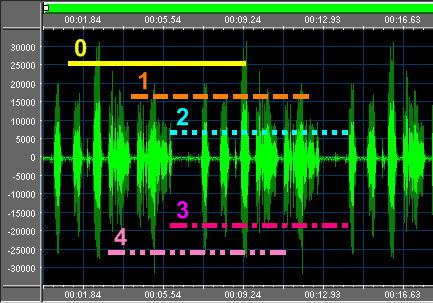 The current settings can be retrieved through the WaveformAnalyzer.GraphicItemHorizontalLineParamsGet method and modified through the WaveformAnalyzer.GraphicItemHorizontalLineParamsSet method. Color used for rendering the line. 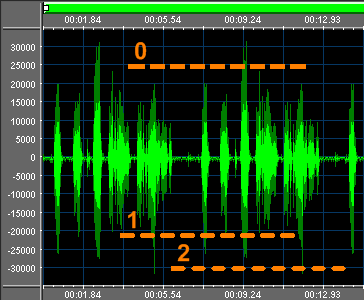 Audio channel on which the horizontal line is drawn. Height of the line expressed in pixels. Transparent factor. This value can range from 0 (total opacity) to 255 (total transparency). Values outside of this range will be automatically capped to the nearest valid value. Vertical position of the line expressed in percentage of wave amplitude. 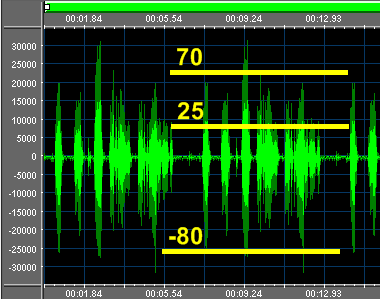 On the screenshot below you can see 3 horizontal lines, 2 on positive peaks, respectively at 70% and 25% of the waveform amplitude, and one on negative peaks at -80% of the waveform amplitude. Type of cap for the left end of the line. Specifies that the line ends are anchored with a square. Specifies that the line ends are anchored with a circle. Specifies that the line ends are anchored with a diamond. Specifies that the line ends are anchored with arrowheads. Type of cap for the right end of the line. Supported values are the same as seen for the nLeftCap field above. Type of dash/dot cap for the line. Specifies a square cap that squares off both ends of each dash. Specifies a circular cap that rounds off both ends of each dash. Specifies a triangular cap that points both ends of each dash.